and the demise of oil around the world. This article appears in the July 2008 issue of Oilsands Review. 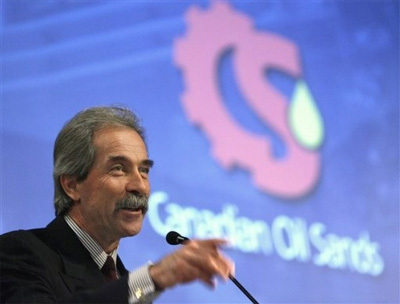 Canadian Oil Sands Trust owns the biggest single share of Syncrude (37%), and the firm’s CEO is also Syncrude’s chairman. Oilsands Review asked Marcel Coutu about operating and environmental issues at the oil sands giant. His edited comments follow. OSR: Developing new technology has been part of the business from the beginning. To what extent is that still the case? MC: The first few years of this business were about survival, because oil prices were low and costs were high. When oil prices were low and margins were thin the driver for this business was always lowering costs. That really hasn’t changed much. Both Syncrude and especially Suncor have been major developers of new technology. Suncor, for example, developed hydro transport – technology that enabled us to move oil sands ore by pipeline rather than truck. So all of a sudden we were operating satellite facilities, without having to truck ore to the processing site. That was a major innovation. The tailings ponds are a major challenge area. It’s an important functioning part of our operations, and enables us to recycle our water. It’s a major challenge. We need to find ways to separate clay from the water more rapidly. This will help us reclaim land better. OSR: Oilsands inflation has been high in recent years. How has that affected you? MC: The one inflation component that has dwarfed all the others is the price of natural gas, which has moved up in parallel with the price of oil. We buy eight-tenths of an MCF of natural gas for every barrel of light sweet product we produce. The rest of our costs are increasing by low double-digit to high single-digit numbers, and over the years those costs add up. Fortunately, oil prices have more than offset operating-cost inflation. OSR: How much energy do you consume for every barrel of oil you produce? MC: About 1.5 gigajoules (1.5 MCF of natural gas equivalent) per barrel. That’s higher than 0.8 MCF, the number I mentioned earlier; that refers to purchased energy. The total energy we consume in our operations includes energy we generate as a by-product to our upgrading processes. It is largely electrical energy, in which we are more than self-sufficient. We produce a lot of waste gas from our processes, and use that to fire gas turbines. We also have a lot of waste heat from our operations, and we raise steam with that heat and put that steam into steam turbines. This makes our operations more efficient. Beyond that we arbitrage against the price of electrical power around the clock, sometimes selling electricity into the Alberta grid, sometimes buying it, depending on how those conditions align. We arbitrage those markets in both directions. We do the same with natural gas. It’s one of the businesses we do to make ourselves as energy efficient as possible. OSR: How are you managing carbon dioxide emissions? MC: We’ve been reducing them from the time we opened the plant gate. Carbon dioxide emissions are all about energy consumption – they are exactly the same thing; reciprocals, if you will. You only create CO2 emissions by burning fuels. We have always been incentivized to keep our energy consumption as low as we can, and lowering consumption means lowering CO2 emissions. We have always been focused on reducing CO2 emissions because they represent a direct cost to us. OSR: You are a member of ICON, the Integrated CO2 Network. Any thoughts on carbon sequestration? MC: The plants at Fort McMurray are the largest collectible source of CO2, but it is an expensive proposition. You have three levels of major expenditure there. You could sequester a lot of CO2, but I’ve seen numbers that you are actually generating more CO2 than you are sequestering by going through this process. First you have to construct equipment to extract the CO2, then build a pipeline, then pump the carbon dioxide into the saline aquifers, salt domes, old reservoirs or whatever you use to host the stuff. OSR: The notion that crude oil supply is about to peak or has peaked is gaining a lot of currency. What do you think? MC: Natural gas is in vast supply around the world but oil is not. Crude oil production in most of the producing countries in the world is in decline. All OPEC can now do is raise prices by cutting production. They cannot lower prices by increasing production because they don’t have the capacity. We are in a very pure free market situation, with prices being set by supply and demand. When I look at that dynamic, I have stopped worrying about the demand side. No matter how much the US goes into recession, for any period that is important to any of us, any decline in consumption there will be offset by increased demand elsewhere – in China and India, but also in developing countries that produce their own crude oil. Those countries generally subsidize oil products, and subsidies accelerate demand growth. At these prices you are seeing some conservation somewhere, but it is being more than offset by increased demand somewhere else. Whether people are still going to be buying at $200 a barrel I don't know, but by the time we get to $200 it will be the supply side that will keep things tight and moving upward. OSR: How serious a problem is maintaining global production? MC: Very. World oil production is generally in decline. You can assume that out of global production of 87 million a day, productivity will come off by 5-10 percent every year, so you have to replace that production each year before you can even begin to satisfy global demand growth. So what we are seeing is the demise of the commodity, since we are never really going to be able to meet the demand. Prices will be volatile, but the trend in my view is that prices will continue to climb. The demand will be fully there regardless of anything that happens to the US economy. The decline is real and cannot be arrested, at least not in the short term. One hundred and fifty dollar oil is within striking distance. OSR: What is the role of the oil sands in this environment? MC: Oil sands production is close to a million barrels a day, a little more than 1 per cent of global production. It’s going to take a huge amount of effort, capital and time, maybe ten years, to double Canadian oil sands production. It’s true that the Canadian resource is huge, but accessibility is long and slow. Our impact will be very slow. One thing we need to bear in mind is that the size of our resource goes up with the price of oil; the higher world oil prices grow the greater our resources become. We have re-evaluated Syncrude’s leases, and that re-evaluation has taken us way up from 9 billion barrels, which was our traditional resource base. That’s good for Canada and Alberta and the rest of it. OSR: How are you dealing with the labour shortages around Fort Mac Murray? MC: To answer that, you have to think of labour as being in two buckets. The people in the operational bucket are there for the duration. They have great careers, pension plans and so on. Everyone puts their shoulder to the wheel, and we get the job done. We lose some people, but the situation is manageable. Then there is the contract bucket – construction workers, pipefitters and so on, who are mostly there to work on expansions. They are there on a temporary basis and they are hard to hold onto. They are the challenging part of the work force. The labour problems we face are focused in that area. OSR: Having waterfowl fly into the tailings pond brought international attention to Syncrude. Do you want to comment on it? MC: We’ve extended apologies to everybody. It was really a heartbreaking incident for us. Why did it happen? Because we didn’t have our equipment deployed before the ice thawed. It’s something we have been managing for decades with success, but we got caught by the weather. We didn’t have our deterrents in place. OSR: What are some of the other environmental issues you face? MC: In general, our environmental story has been glowing. Where we have done a poor job has been in telling the world about it. I’d like to comment in three areas – water, air and land. Let’s start with water. At Syncrude we consume two tenths of 1 percent of the water from the Athabasca River for our operations. We recycle as much as we can. If you extrapolate from that, the whole oil sands industry consumes less than 1% of the Athabasca’s flow. Air is a more serious issue. We reduce our CO2 emissions because it makes economic sense, as I said earlier. But there are nastier things that we have been managing for years and they cost us a lot of money, and the nastiest of them all is sulphur dioxide. Our SO2 emissions peaked at 250 tonnes per day when we were producing around 250,000 barrels a day. In our last expansion we moved from 250,000 barrel per day to 350,000 barrels per day, and we invested about $1 billion in SO2 scrubbing equipment. We not only stopped the growth of SO2 emissions but reduced them slightly from our peak levels. Now we are spending another billion dollars to reduce those emissions to about 150 tonnes per day. On the land side, in March we were the first company in the whole industry to get certification for land reclamation. We have returned that property to the province. It’s really impressive. You would never know there had been a mine there.